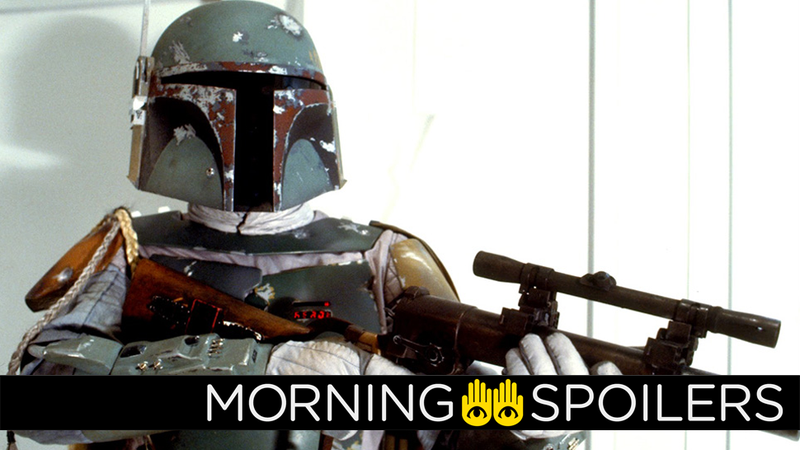 Could the Boba Fett Spinoff Movie Be in the Works Again? It might not be too long before we hear more about the Nightwing movie. Skyler Samuels teases the big reveal from the latest episode of The Gifted. Plus, what’s to come when The Walking Dead and Lucifer return, and Mark Hamill ponders the celibacy of the Jedi. Yes, really. To me, my Spoilers! Omega Underground claims that producer (and now X-Men director) Simon Kinsberg is attached to direct an upcoming Star Wars production codenamed Tin Can, with Lawrence Kasdan producing. The outlet speculates the title may be a reference to Fett’s purportedly indigestible Mandalorian armor, meaning this would be the project Josh Trank was unceremoniously booted from in 2015. Novels in the run-up to the release of The Force Awakens did tease that someone, if not Fett himself, was still using the armor after Return of the Jedi, sparking the question of whether a solo Fett movie would be set before or after the character’s apparent death in Return of the Jedi. A casting/movie update is coming in February, according to director Chris McKay on Twitter. Omega Underground reports production begins October 2018. Mark Hamill spoke to /Film about how he was able to get into the mind of the film’s reclusive and dejected portrayal of Luke Skywalker. And also Jedi celibacy, as you do. Well, you’re hitting a point that was a bone of contention. Because you see in the trailer he says, I know one truth, it’s time for the Jedi to end. And I said to Rian, I said, what are you talking about? A Jedi doesn’t give up. If they make a wrong, they try and make it right. That was a big kind of thing and I had to realize it’s not for me to decide. When I see what he was doing that, what my function in the script was my job was to put my own personal feelings aside and do my best to realize his vision. Not Mark Hamill’s vision, Rian Johnson’s vision. Whether I agreed with it or not. ‘Cause, I mean, I used to say to George, it was funny, why can’t Luke have a girlfriend? Eventually, I heard in the Extended Universe there’s Mara Jade. And he got married and he had kids. I still don’t know, are [Jedi] supposed to be celibate or can they be married with children? Can you answer that? I think the Jedi are supposed to be celibate, but…I kind of think Luke is saying something like this organized religion has turned this thing that was good for something bad. Right. Well that’s a good way to go. Another way to go is when I say, look, a lot of times in acting you have to find things that are parallel in your own life to know how to react emotionally at any given scenario. And so I thought I was of The Beatles generation. And I bought that “All You Need is Love.” I said, by the time I get to be, our generation is in power they’ll be no more wars. They’ll be no more racial discrimination. They’ll be peace and harmony. We failed. Arguably the world is worse now than it was in the ’60s and early ’70s. So I drew upon that to try and figure out why Luke was so disillusioned. Why he so tragically failed. He did fail. Obviously, he thought Ben Solo was the Chosen One and he was wrong. Now he’s almost responsible for the rise of the next Darth Vader. Now that’s where you get into the weeds because my contention was he wouldn’t let that go. He would try and correct that. But for the purposes of the story and I without really revealing too much, you’ll understand more when you see it. And again, I totally trust Rian and I think he’s done a spectacular job. How do I say this without giving anything away? It makes sense—I feel like Nebula might be in future trailers. Entertainment Weekly has a photo of Stan Lee cameoing as a limousine driver. in the Hulu series. Meanwhile, Spoiler TV has the titles and synopses for the next three episodes. Skyler Samuels spoke to Entertainment Weekly about last night’s reveal her character, Esme, is secretly one-third of the Stepford Cuckoos. I hope they’re happy! We spent a lot of time and effort on it. I’ve had my hair cut, and my wardrobe and everything is supposed to be a replica or homage to the comic books, so it’s a very true representation of the Stepford Cuckoos and the Frost sisters, which is pretty cool. The hive mind definitely carries on in the show, which is kind of insane to film. And here’s a trailer for the show’s return on January 1st. We also have a promo for Lucifer’s return the same night, January 1st. Syfy speaks to Grant Morrison and Chris Meloni in a new promo. ...while a second promo sees interviews with Medina Senghore and Lili Mirojnick. Finally, AMC has a trailer for The Walking Dead’s return in February.